First the big news – I have finished Love & Freedom and sent it in to Choc Lit! Big whoop! So, now, before I get my rewrites, I’m going to catch up on other things, like blogging. Love & Freedom is the first book I’ve written along a time line. 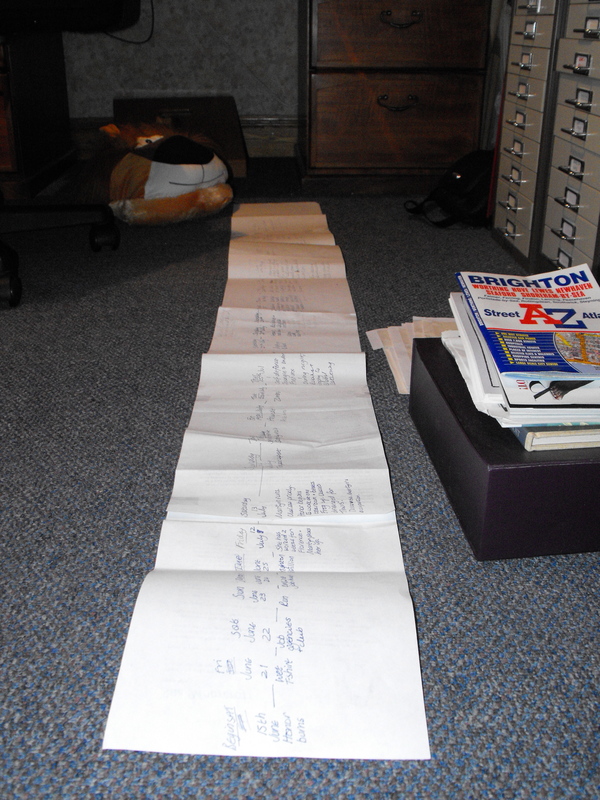 Having had editors find fault with my (admittedly hazy) timelines in the past, with the current book, I began a timeline. 15th July. H meets C. M working away. > 18th Aug S turns up > 30th Aug M discovers who R is. You can see from my photos (!) – can you see, or does it just look as if the Andrex puppy went mad in here? – that I ended up with quite a document, and if your scribble is smaller than my scribble, yours might be shorter. But, the point is, it worked. And if my editor has queries, I will be able to answer them. It was incredibly easy to keep track of my book and took a few seconds each writing session. I’m sure I’ll do this for every book from now on. And it has made editing easier, too (I always write 3 or more drafts) and although I looked hard, I didn’t come across any places where I’d got into a mess. Whether the editor finds mistakes? Watch this space! I also had a calendar for the year, so I knew which days dates would fall on and a backward-looking timeline for when each character is born/married/leaves the country etc. NB If you’re wondering what the lion has to do with the time line, the answer is ‘nothing’. I just thought you might like to see him. He’s my favourite Christmas present, this year – a footwarmer for under my desk. Quite what he thinks about having my feet stuck in his head all day I have no idea, but I love him very much. Mwah. I use a grid with three columns: the first for day/time interval/month, the second for brief description of events/action and the third for chapter number. Apart from keeping me sane, it ensures that things happen to different people in the correct order and that people know things at the correct times in the story. Agree that chapter numbers would be a useful addition but I don’t number my chapters until I’m ready to send the ms. Because sometimes I move them around and get in a horrid mess! My timeline for the Lothian Dragon books was typed on several sides of A4 in a chart in Word – but yours looks much more fun. Funnily enough, I’d read in Writing Magazine, following Sophie King’s articles ‘How To Write A Novel’, about creating a time line (was one of her last articles). Her suggesting was more after you’d written the book, to go through and create one as you read it through… which is my plan to do with my first completed novel! (Letting it rest for a bit, just because it takes over otherwise). Admittedly, although The Wedding Favour only goes over a few weeks, (and I was concious I was whacking the potential reader over the head with it, so some of it might become subtler in the editing) I did put a schedule up in my OneNote notes for the story. Because it is actually a niggle of mine, I do hate it when time lines are wrong. Oh and love the lion! I want one. My feet always get cold. Although really I need to invest in a footrest first, as I know some of my back/arm problems are due to not sitting properly at my desk. A timeline is vital – sometimes it’s obvious an author has not worked hers out. I couldn’t do it your way, though, I do mine down the page and a two month time line runs to about 3 sheets of A4. Very interesting to see how you’ve done this, Sue – I am conscious that I need to do something similar. Can I ask – how do you handle flashbacks in your timeline? Do you place them in the correct place on the timeline, or in the place where they occur (‘are remembered’) in the narrative? Or do you have a separate line with arrows pointing in and out, or colour codes, or…well, it confuses me, as you can see! I’m not a huge advocator of flashbacks. They’re backwards looking and so hold up the impetus of the story and I don’t feel they add to PTQ. I try and keep my story going forwards all the time so backstory information, which might otherwise be handled in flashback, is brought out via introspection and conversation, instead. I can’t think where’s there’s a flashback in Love & Freedom. Which doesn’t actually answer your question! Different genres might lend themselves more to flashbacks – sagas seem to use them a lot. But my personal rule is if I can avoid a flashback, I do. has anyone used project software for timelines? I used to a project manager and I’m using microsoft project to timeline the planning of my novel. Going OK so far. It keeps me on target and prevents wild inconsistencies. I’ve not heard of Microsoft Project. Is it a stand alone programme or part of a bundle? It’s a separate software that you would get with Office Professional (maybe?). It’s more about setting milestones, planning projects etc. Not probably necessary for writing… useful if you maybe already had it, but I prefer your A4 paper time line myself. Brilliant, Sue. Thanks for sharing. Now all I’ve got to do is remember to DO it! 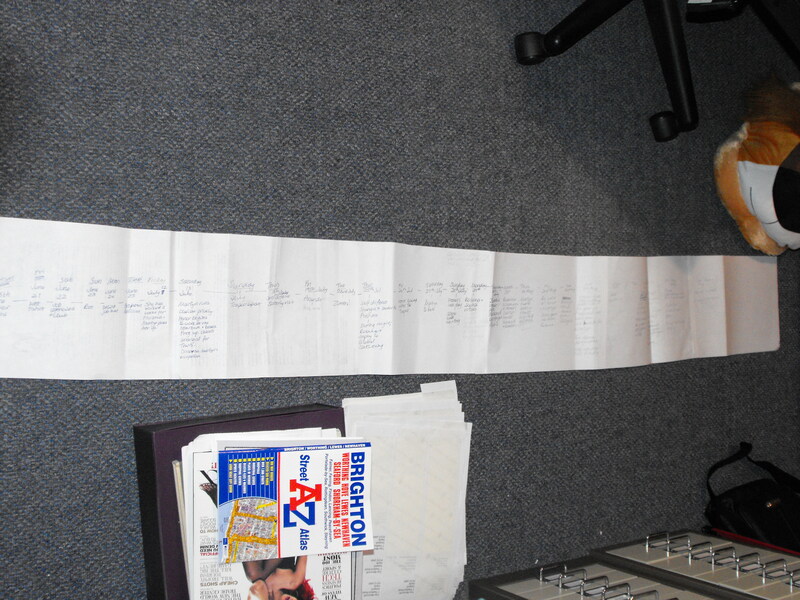 Oh my, that’s a long bit of paper. Can imagine seeing you running up and down to read it as you think of something. Love your timeline photo. Mine have tended to be in my head ( and not very reliable) with the odd note scrawled on A4. Now planning a historical novel involving some real people. Have already started a timeline (on Excel) so that I know how old they are and what else might be happening at the time. Like your paper version, though. Probably easier to see everything at one go. Looking forward to Saturday – assuming I get there! I’m looking forward to Saturday, too. Hope to see you there. Sue Curran (remember her?) many years ago set me using timelines and couldn’t have written my saga without it. I use an Excel spreadsheet on the computer for mine, saves reams of paper and struggling to get up off the floor with my creaky knees. Yes, I do remember Sue Curran but haven’t heard anything of her for years.